When I am out driving I will often see something interesting that I think would make a nice photo. Sadly, though, I have to admit that it tends to occur when I am in a goal oriented situation....have to get to work, have to be on time etc.....and, in these situations, I rarely stop to take the shot, even if I happen to have a camera available. On one particular occasion a few months ago, it was a foggy morning and I was driving my son to a fencing competition in Harrisburg, PA, which is a fairly rural community. As we were looking for the high school where the competition was to be held, we passed a farmhouse with a large old tree in a field out in front of it. 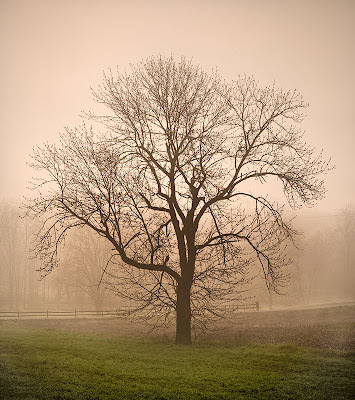 As we were driving by I remember thinking that the tree would really make a nice image in the fog. I did have my camera with me, as I was planning to take some pictures of my son fencing, but I was, again, being very goal oriented and wasn't planning to stop for fear of being late to the competition. The scene looked eerie enough that it even attracted my son's attention, who, as a teen-ager, is not typically excited by scenery. He said "Dad, that looks really cool, you should get a picture of it". With that said, who could resist? I asked him if he would mind if I dropped him off at the venue, which was about a half-mile away, and let him check in by himself while I came back to take some photographs. "No problem." So I went back. I didn't have a tripod, so I just took the pictures handheld. As I took the shots, I had in my mind the idea of trying to give the images an 'old fashioned' feel. I guess this teaches me that there is something satisfying about stopping to take a shot of something that grabs your attention, even if it does sidetrack you for a few minutes. It isn't necessarily always easy....but I am going to try to do it more often. One thing that often keeps me from being spontaneous is that I frequently notice scenes that would make interesting photographs while driving on the highway, where it would be dangerous to stop to take pctures. In addition, it is often difficult to be certain about out how to get off the main highway and back to the location on smaller roads. I am curious as to how people that may be reading this deal with seeing something that they feel is worth photographing when they are on the road. Do you typically stop or not? If you do, do you get off the main road or shoot from the shoulder? How much time will you spend when stopping? If the scene would make a better shot closer up do you ever knock on someone's door to ask permission to go on their property? Do these type of unplanned shots that grabbed your attention tend to become 'keepers', or were they just interesting for the moment?